UDM Downloads > Ceramic Wares! 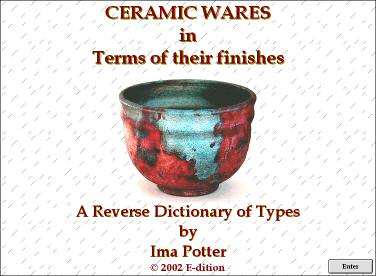 This ebook is for collectors, practitioners, and students of ceramics who are in need of technical and yet handy referencing to those types and techniques known first by their materials and second by their manufacturers: under the listing for a given ware type, thorough descriptions of physical makeup and techniques for making are followed by names, dates and places of manufacture where exemplary pieces can be found. For example, under AGATEWARE are credits directing the reader to the English manufactorys of Wedgwood, Astbury, and Whieldon as originators and standard-makers for European agateware since the 18th Century. An appendix provides specifically historical treatments for the three most general types - "earthenware", "stoneware", and "porcelain" - by placing their oriental and occidental origins of manufacture. Fully illustrated, over 200 pictures. Can be searched by page or whole ebook, alphabetical index, lexicon, personal notes editor and web browser make this ebook a complete tool for the student or the pro.